"If you're like me you always shed your rain cover up before going into the arena...then it's a wet day from there on out! Good news! It doesn't have to be any longer!" 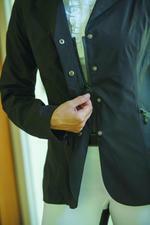 This FITS black Hydra water-proof show coat will keep you dry all year round with fully taped seams, a special self-sealing zipper, 4 black snaps, and a double vented back. 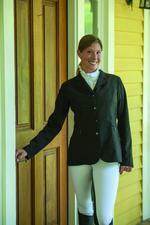 Made from a soft shell outer layer- this jacket will shed all dirt, hair, and shavings.